"I was surprised not to find a recipe on Allrecipes for a Philly-style Chicken Cheese Steak so I decided to create and publish one. Depending on who you ask, this sandwich may or may not be authentic Philly style, but it is fantastic. 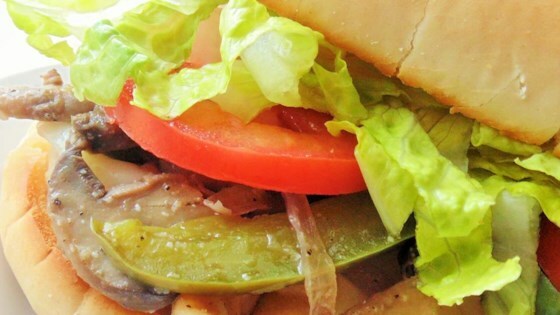 Getting a good, fresh hoagie roll is key to this sandwich being perfect." Place chicken between 2 sheets of heavy plastic on a work surface. Firmly pound chicken with the smooth side of a meat mallet to a 1/2-inch thickness. Cook chicken breasts on preheated grill until no longer pink in the center and the juices run clear, 2 to 3 minutes per side. An instant-read thermometer inserted into the center should read at least 165 degrees F (74 degrees C). Shred chicken; season with seasoned salt. Heat olive oil and butter in a skillet over medium heat. Add onion, bell pepper, and mushrooms; cook and stir until browned, 5 to 7 minutes. Stir in chicken; cook until heated through. Set oven rack about 6 inches from the heat source and preheat the oven's broiler, or preheat a toaster oven. Spread chicken mixture on the bottom half of each hoagie roll. Lay 2 pieces of provolone cheese side-by-side over chicken mixture. Place hoagie rolls under broiler or in toaster oven and cook until provolone cheese is melted and bread is crunchy, 2 to 3 minutes. Spread 1 teaspoon mayonnaise on top half of each hoagie roll. Top each half with 2 tomato slices and 1/2 of the lettuce. Fold halves together and roll each hoagie tightly in foil, using a knife to push any filling back inside. Set aside for flavors to blend, 1 to 2 minutes. I used 10-inch hoagie rolls. You could probably get 4 sandwiches using 6-inch rolls. Don't skip the foil step!